These three bedroomed rental villas, both can sleep upto 9 people with the top floor consisting of double bedroom, bathroom with shower and an extremely large roof terrace, the first floor has another double bedroom along with a twin bedroom, and a bathroom with corner bath. On the ground floor there is another bathroom with shower for added convenience throughout your stay. Also on the ground floor is a fully equipped kitchen, dinning area, a large living room with sofas and cable TV. The living room has one double and one single sofa bed. Hot and cold air-conditioning is provided for the entire ground floor and the master bedroom. 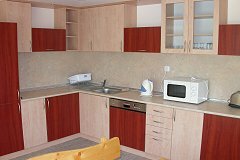 The kitchen is fully equipped with a dishwasher, washer / dryer, microwave, cooker and all other appliances. These rental villas are excellent value for money and the price includes your airport transfer*, weekly laundry and clean and 24hour emergency assistance from the Pride Rentals team. * - Please visit our terms and conditions page for more information on airport transfers.